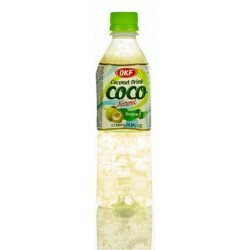 OKF Coco 100% Natural Original Coconut Drink with pulp in 16.9fl oz (500 ml) bottle. OKF Coco 100% Natural Original Coconut Drink with pulp in 16.9fl oz (500 ml) bottle. Refreshing natural Coconut juice/ water with pulp. Product of Korea. Halal Certified.